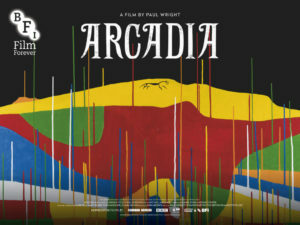 Portishead’s Adrian Utley and Goldfrapp’s Will Gregory have teamed up to create the original soundtrack for the new Paul Wright film ‘Arcadia’. Simon Tucker reviews. How very apt. The recent release of the BFI funded Paul Wright film ‘Arcadia’, which focuses on our complex connection to the land we live in, has come just as them in those halls have voted to expand Heathrow airport thereby helping to speed up the burn of the planet all to feed the greedy and guzzling beast of London and business. As always, profit comes before future. Suits before grandchildren. The film comprises of over 100 film clips from over 100 years displaying our changing attitudes to the land and to each other and with the score, Adrian Utley (Portishead) and Will Gregory (Goldfrapp) create a time-travel work that positions the listener in the front seat of a machine whose journey begins with the gentle strum of Celtic folk balladry and screams us forward through Industrial oppression and string-laden serenity. It is a score that not only succeeds in its objective of being a thrilling and engaging listen but also as a history lesson which should be taught to children in school. Though it is highly recommended that you watch the film it was created for, this score can be listened to entirely separate from the source and you will still understand completely what lessons it is teaching you. The real intelligence of Utley and Gregory in creating this score is that they lead the listener perfectly through each section with each track slowly feeding the other in a gradual evolution much like the history of mankind itself. There have never really been huge leaps forward just one idea leading to another and so forth and this is what the pair capture in the music they have created. When the gorgeous opener ‘Lowlands’ (which features the stunning voice of Anne Briggs) leads into Amnesia there is a distinct shift in instrumentation but with Utley and Gregory using a classic sounding piano to open the track and to lead a sporadic melody throughout the piece you are connected to the older music of the past to the future here on display via the droning synth that acts as a bed, every now and then emerging to the fore. This linking of echoes of the past to the sounds of the future is key to this scores success and it helps ground the listener, giving them a feeling of travel that is at once safe but thrilling. There is a lightness of touch throughout ‘Arcadia’ which adds to its cosmic feel. There is no squeezing of square pegs into round holes. Everything just seems…..right. As a history lesson we are being taught by two professors who know their subject inside and out. They lead us through the Glam-stomp 70’s (Russel & Victor) to the grimy basement experimental electronica scene (Blood In The Soil, Industry) which was birthed by artists such as Throbbing Gristle and Cabaret Voltaire. Nudists plays like the 60’s artists discovering LSD, Mandrax and the avant-garde scene blossoming in Germany whilst Bonny Boy smashes the ancient tradition of hymnal folk singing (a returning Anne Briggs) together with the grand threat of heavy prog and BBC Radiophonic Workshop experimentation. With ‘Arcadia’ Adrian Utley & Will Gregory have created a work that perfectly blends the duality of human existence (light and dark) together, allowing moments of utter sadness to mix with a sense of optimism for our future. It is a perfect score for these far-from-perfect times. Through its sounds we are shown what we have achieved as a species when it comes to the development of audio art but also serves as a stark reminder of the horrors we have inflicted on our soil and on each other. Hopefully we can learn and improve but based on recent news and the decisions of those who are meant to be looking after us we still have a very long way to go…..until then, play this album loud and recommend it to everyone you meet as you never know, that person could go forth and have that one idea that leads to our next great achievement. ‘Arcadia’ OST is available now digitally via Bandcamp with the vinyl and CD versions to be released soon.